Of all the techniques I have listed, blogging is the most work to keep up with. It is also probably the slowest growing method on the list. In order for one of your blog posts to go viral, people have to know your blog exists. With so many quality blogs already in existence, it may take some time to get your blog noticed. It requires persistence. Before you decide to begin blogging, make sure you are interested enough in the topic to write about it on an almost daily basis. For a blog to be effective, you need to post at least 3 – 5 articles a week. While the posts do not need to be long, they should at least contain the elements that any technique needs to go viral; a unique point of view on a subject, informational, entertaining, and fresh. Not only do you need to be consistent in posting new information, you also need to work at marketing your blog. There are several easy ways to start getting other people to pay attention to your blog. Start by finding other popular blogs that cover a similar subject as you cover. Leave insightful comments on their blog. When you leave a comment, you can include a link back to your own site. If some reads your comment and like what you have to say, they may head over to your site to see what else you have to offer. If the blog you leave a comment on is very popular, this could drive a fair amount of traffic to your site. Another method of getting your blog notice is to write a post on your blog commenting on something you read on someone else’s blog. You add a link in your post pointing back to the blog you mentioned. In blog language this is referred to as a “trackback”. When you put the URL of the other blog in the trackback section of your blogging program it sends a message to the blog you are linking to informing them that you mentioned them in your blog. They come and read what you said, and if they like it, they may write something on their blog about your post. Their viewers can also click the link, which will drive traffic to your blog. It is very easy to get started blogging if that is an area you are interested in. There are several good online blog services that will allow you to set up a blog for free. Some of these services, like Blogger.com, even allow you to set up AdSense advertising on your blog, which will let you earn a little extra income with your blog. If you would rather have the blog located as part of your own website, programs like WordPress are very easy to set up and use. The best part is, it is free to use. If you write good blog posts, and can effectively market your blog, your readership will grow. 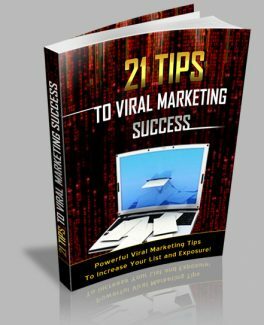 The more readers you have, the greater the chances of one of your posts going viral. The key to success is quality material that is fresh, and holds the readers attention. You can not get away with recycling what you read on someone else’s blog. When visitors come to your blog, make sure you give them a compelling reason to go to the main part of your site to look around. If your blog becomes popular, this method could drive a flood of traffic to your site that will continue on an almost daily basis.